In one of the most striking passages of the Inferno, Francesca da Rimini recounts her tragic love story to Dante. Francesca describes how she and her lover, Paolo, read the tale of Lancelot and Guinevere. Moved by their reading, the two kiss, suffering tragic consequences when Francesca’s husband discovers the affair and takes their lives. Dante is overwhelmed with pity for the lovers, and upon hearing Francesca’s final words: “A Gallehault indeed, that book and he/who wrote it, too; that day we read no more” Galeotto fu ‘l libro e chi lo scrisse/quel giorno più non vi leggemmo avante, the pilgrim faints: “And I fell as a dead body falls” [e caddi come corpo morto cade] (Inf.5.142). Some commentators read the scene as a warning about misreading, or as Dante’s rejection of the courtly love tradition. Francesca offers a condemnation of the text by drawing a parallel between the book and Gallehault, the knight who hides Lancelot and Guinevere as they kiss. Francesca makes the book and its author the culprit for her sin and denounces the writings of courtly love in the process. But the canto condemns Francesca and censures her reading of Lancelot and Guinevere. Plutei 89, inf 61. Biblioteca Mbedicea-Laurenziana. Although this specific moment doesn’t mention the presence of Gallehaut, the rubric at the top of the page explains a meeting between Gallehaut, Lancelot, and Guinevere: “Quant la reine Ge[nieure] dona li buen ch[evalie]r a [com]paign[ie] a Gal[aa?d] [et] dist li q[u’i]l auoit n[om] Lance[elot] do lac q[u’]il ni sauoit so[n] no[m] [et] dona Gal[aad?] por [com]paigno[n] a lanc[elot].” The complicated relationship between the three figures is present in this manuscript, even if not as explicit as Francesca makes it in her speech. 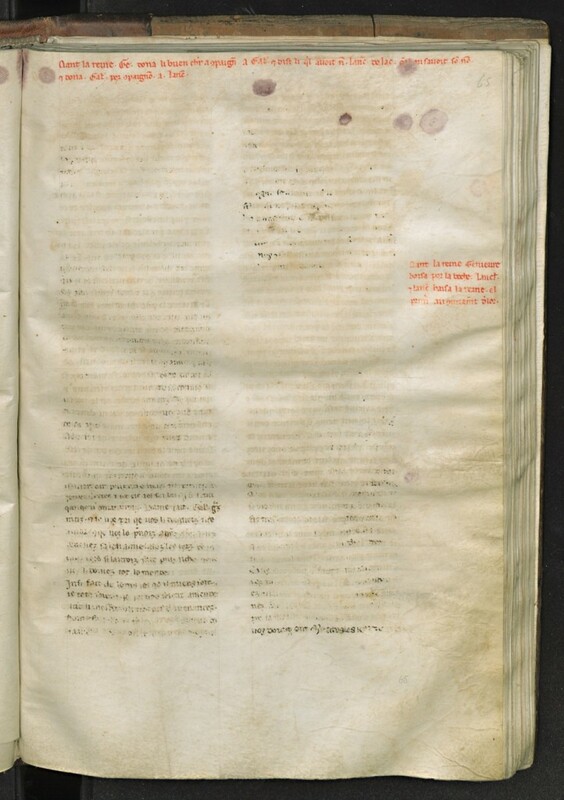 14th Century Manuscript. Pierpont Morgan Library. 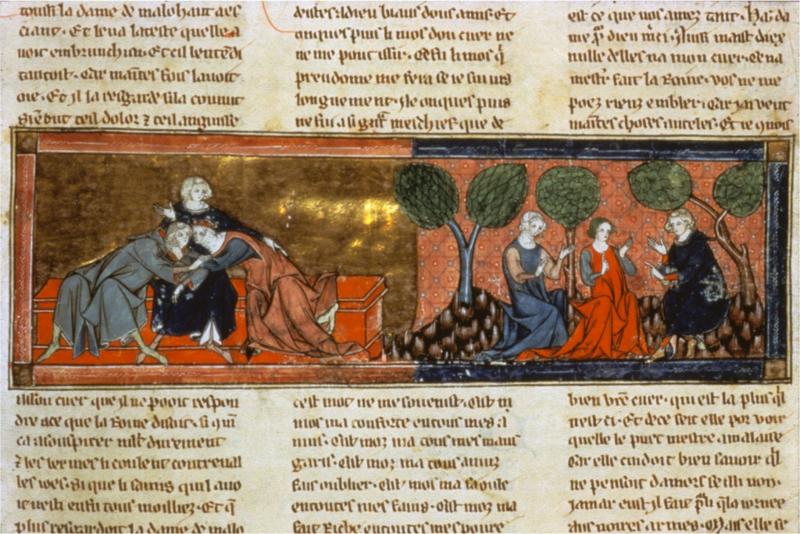 In this image, the presence of the Lady Mallehaut on the right helps explain a reference to the kiss that will appear in Paradiso 16 (13-15), when Dante draws a connection between Beatrice and the Lady Mallehaut. Beatrice smiles, just as the Lady Mallehaut coughs at the kiss, reminding Guinevere of her fault. Dante’s Arthurian references, however, are not limited to the Comedy and in addition to manuscripts, it is likely that the tales spread orally (See also: Otranto Mosaic). Allaire, Gloria and F. Regina Psaki. Arthur of the Italians: The Arthurian Legend in Medieval Italian Literature and Culture. Cardiff: University of Wales Press, 2014. A Companion to the Lancelot-Grail Cycle, edited by Carol Dover. Cambridge: D.S. Brewer, 2013. Hoffman, Donald. “Lancelot in Italy,” in Companion to the Lancelot-Grail Cycle, ed. Carol Dover. Cambridge: DS Brewer, 2003. Papio, Michael. “Lancelot” in Medieval Italy: An Encyclopedia, ed. Christopher Kleinhenz. New York: Routledge, 2004.